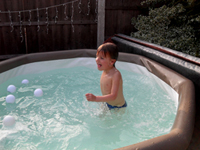 Looking For Hot Tub Hire In The UK? A warm welcome from HotTubRentalUk.co.uk. We supply quality Hot Tub Rental in the East midlands, the West midlands South Yorkshire and Stoke on Trent with a first class friendly service that gets us recommended time and time again. Rent a Hot Tub from us and you will be sure to have a great, memorable hot tub experience. Hire a Hot Tub that can be set as high as 41 degrees c and holds 6-8 adults. All of our Jacuzzis have hydro or air jets and come with a cover to retain the heat. Everything is taken care of from the start and we supply your chemicals and filters so you can just sit back and relax. We now have a large stock of the popular one piece type Orbis hot tubs that have proper seating and a light inside. We also still have a limited amount of Canadian spas for people with poor access. One of our engineers will arrive with the hot tub and have it ready to fill in as little time as 20 minutes. Access is never a problem for our Canadian spas, if you can walk through it we can get our hot tubs past it. Our tubs fit through gates and narrow passage ways or even through the house. We will then show you how to use the controls, add chemicals and advise on anything else thats appropriate for your hot tub rental on the day. We Carry a selection of different tap connectors and hoses so we can take water from any tap in your house if you don’t have an outside water supply. Our hot tub rental engineers also carry extension leads so all you need is a flat area for it to sit on and thats it. If you are hiring a hot tub from us we can cover all circumstances and if its a last minute hot tub party but you are stuck at work we can still deliver it and fill it up for you providing you have outside power, water and the gate is open. All this for just an extra £40. We can work with you to create the perfect theme to make your hot tub hire experience even more special. Take a tour of the gallery and see the many happy customers.